If you currently have DACA, you should request renewal 150-120 days before it expires to minimize the possibility that your current period of DACA expires before you receive a decision on your renewal request. If you now have DACA , USCIS will accept renewal requests more than 150 days in advance of your DACA expiration; however, this could result in an overlap of your current DACA period and your renewal period. If your expiration date is over one year, you can renew. Typically, USCIS will not reject renewals if the expiration date does not exceed one year. If you had DACA previously and it expired more than one year ago or was terminated, you may not request DACA as a renewal, but you may file a new initial DACA request. As addressed above, if you had DACA and it expired less than one year ago, you can request renewal and USCIS will typically accept the request. If you would like to implement a family preparedness plan due to the uncertainty of the DACA program, please contact Student Legal Services. In addition to some other requirements, to qualify for deferred action, a person must not be convicted of a felony, a significant misdemeanor, three or more other misdemeanors, or otherwise pose a threat to public safety or national security. U.S. Citizenship and Immigration Services (USCIS) will not accept advance parole applications from DACA recipients. University of North Texas students who are in need of assistance with their DACA renewals can email Student Legal Services at StudentLegal@unt.edu to book an appointment or call 940-565-2614. "I want to make clear that I unequivocally support DACA, undocumented and other students who are overcoming significant barriers to educational attainment." Become a part of our mentorship program! 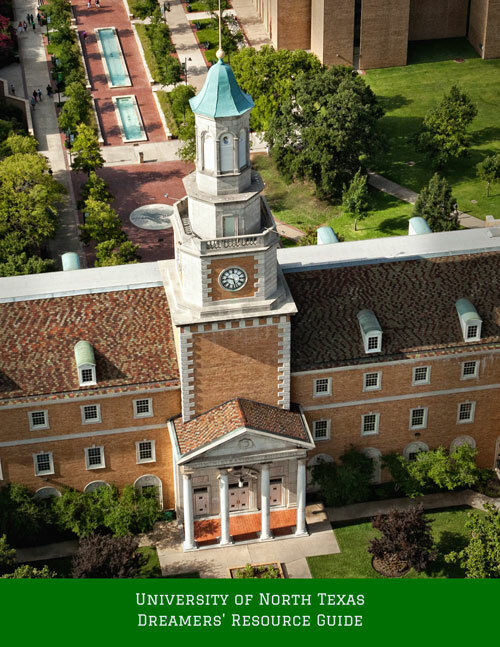 The mission of the Eagle Dreamers Program is to provide mentorship and support to undocumented students at UNT while educating the campus community. The Eagle Dreamers Mentorship Program is sponsored by the Division of Enrollment, the Division of Institutional Equity and Diversity, and the Multicultural Center. "UNT prides itself on being a caring, supportive and welcoming environment for all students regardless of socio-economic background, country of origin and immigration status."